The Digg Site Productions, as a concept, began in 2000. Stacy Heatherly had a successful career in the film industry and was at a point in her life where she wanted a change. She took some personal time away to reflect and gather her thoughts. She contemplated other careers and even offshoots of careers in the film industry. Ultimately, she decided to form a production company and focus on documentaries. Almost immediately after making the decision, she received an email from a woman with a personal story that begged to be told. While Stacy was doing the paperwork to incorporate the company, a thought hit her: What if the company would do something different with the revenue it would receive from selling its films? She did quite a bit of research and discovered an organization in New York that taught college students how to make documentary films. It was a college-length course. This organization also sold its curriculum. She purchased the curriculum and began the work to change our company into a nonprofit. Our first programs were designed to teach high school youth, but we have evolved to incorporate more younger age groups and now offer three camps per year. Stacy developed a plan whereby we could use the revenue from the sale of our films to cover tuition for the students. She knew it would take us a few years to become self-sustaining because we first would have to produce and sell our films to realize the dream. During those years, we would ask for donations and apply for grants. Since 2009, we have gotten the program up and running. The first two programs we partnered with Fremont Public Schools and Metropolitan Community College and offered our students dual credit for the course. We have successfully added camps for younger students, doubled attendance and continue to build programs such as internships for the students. Each year we see the students excel. We receive calls and emails from our students’ family members expressing their deepest gratitude for the opportunity we have offered their students. Stacy’s first film of her career was Too Wong Foo. She had no film set experience and was given the opportunity to work the entire film. Her next film set was working with Alexander Payne’s Citizen Ruth. That film catapulted her career as she continued to work with Alexander and other Directors like Bernie Caulfield Producer of many network movies included Game of Thrones. The Digg Site Productions is a Team of incredible film focused professionals who dedicate endless hours to provide a unique opportunity to students who have an interest in film. Every single person and every single student have made us what we are today. We are so grateful to all our Donors, Supporters, Sponsors, Educators, Volunteers and Parents who help us help kids! 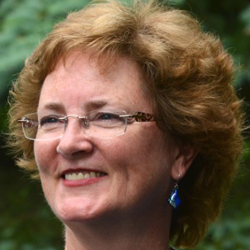 Dana is a “Southern Midwesterner” – born in St. Paul, Minnesota, raised in Montgomery, Alabama, and then made her home in Atlanta, Georgia for 25 years before finding her way to her new home in Fremont in 2015. Dana is co-founder and CEO of Reeves Media Group, LLC, a marketing and media production company based in Fremont, Nebraska. She brings nearly 30 years of marketing strategy and branding expertise to the team. Dana is a classically trained pianist and received her Bachelor of Arts degree from Huntingdon College where she studied music (piano), marketing, and business administration. She is also a writer and graphic designer who loves live music, real books, good coffee, and all things tech, and is a proud member of the Star City Pinball League. A native Nebraskan—born in Lincoln and raised in Elkhorn—Joel moved to Fremont in late 2015 after living in Atlanta, Georgia for 17 years. 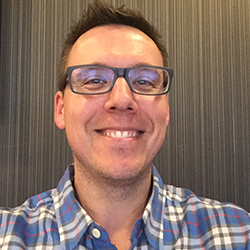 Joel is the co-founder and Creative Director of Reeves Media Group, LLC, a marketing and media production company based in Fremont, Nebraska, and brings more than 20 years experience in video production, filmmaking, editing, voiceover, and sound design to our team. Joel’s first film, “Things That Go Bump In The Night: The Spooky Pinball Story,” was a documentary that chronicles the journey of Charlie Emery, a devoted family man, who gives up the security of a successful 20-year career to pursue his dream in the boom-or-bust world of pinball manufacturing. Joel received his Bachelor of Science degree from Northwest Missouri State University where he studied broadcast communications and psychology. He also received two additional degrees—audio production and digital media—from Full Sail University in Orlando, Florida. When Joel isn’t behind the camera or computer, he enjoys playing his electric guitars, flying his DJI drones, playing pinball (or watching live streaming pinball on Twitch!) Joel is also a proud member of the Star City Pinball League. 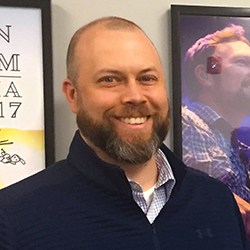 Born and raised in Fremont, NE, Kyle brings over 20 years of experience in Graphic Design, creative and art direction, and marketing to the team. He has always had a passion for giving back to his community—from sitting on the board of directors for John C Fremont Days, and serving as past vice president and president of the Fremont Volunteer Fire Department. 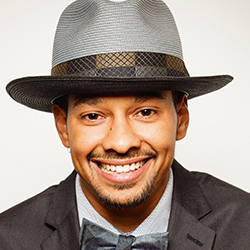 Kyle has a Bachelor of Fine Arts degree from the University of Nebraska at Kearney where he studied visual communications and graphic design. He is currently the marketing director for one of the largest Freightliner dealerships in the United States. In his free time, Kyle enjoys planning adventures with his family, traveling, and telling dad jokes. 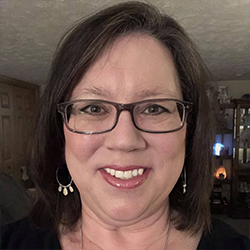 Laura Ostdiek moved to Nebraska in 1999, after completing a Masters degree in Information Resources Management at Syracuse University. She describes this degree as the link between the business and technology aspects of the corporate world. 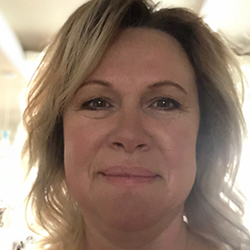 While her career as a project manager in the information technology world has been on a decidedly left-brain track, Laura is happiest when she can balance her life with artistic activities and hobbies, such as singing with Acappella Omaha and designing sets and costumes for the group’s performances. Laura lives in Saunders County, Nebraska with husband Bob and their dog Sadie. Born and raised in Omaha, Nebraska, Randy began his performing career at age 8, singing, dancing and acting in local theater productions, church plays & musicals, and high school talent shows. Temporarily putting aside his Hollywood dreams, Randy attended the University of Nebraska Architectural School and then joined his older brother in the United States Air Force. After completing his active service, he returned to what he loved most…showbiz, performing stand-up comedy and acting in regional theatre in Chicago and surrounding cities in the Midwest. Stacy Heatherly moved to Nebraska in 1979. Her extensive experience in the film industry began as a make-up artist, hair stylist, and actor. She is also an author, having written a book about personal empowerment and enlightenment. In 2009 she combined her passions for film, empowerment, and community into a film-based non-profit organization. 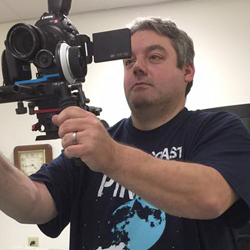 Digg Site Productions produces documentaries to raise money for a summer film camp for 10-12 and high school level students. Student’s produce 15 minute short films that are screened at the Annual White Light City Film Festival. Scholarships are awarded to the students by local contributing colleges and universities. The non-profit and its film camp continue to grow every year. She is commissioner of the Eastern Nebraska Film Office, which is dedicated to developing and nurturing a film-friendly community and infrastructure in Nebraska. Stacy lives in Fremont with her husband, Ken, and her dog, Jeb. 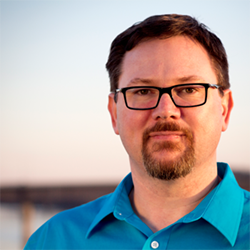 Robert’s nearly 20 years in the nonprofit field makes him a perfect advisor for The Digg Site Productions INC. As a new nonprofit corporation, we value Robert’s expertise and the commitment he has made to assist us with answers to questions as we take this new journey. Robert has been instrumental in teaching us many aspects of the industry as we move forward with our goal. And, yes! 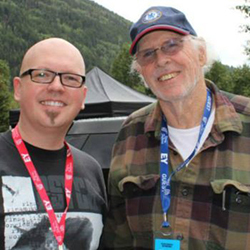 That is Bruce Dern. 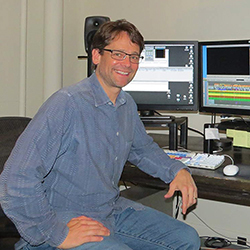 Omaha-based film editor Tom Elkins is known for his work on Inferno (2016), Annabelle (2014) and The Haunting in Connecticut (2009). He also edited (along with Oscar-winning editor Dan Hanley) “Inferno,” and the “Da Vinci Code” sequel from Ron Howard. Elkins first got into the editing trade while working alongside Howard’s now semi-retired editor Mike Hill, who also lives in Omaha. Director of Tennis at Miracle Hill Golf and Tennis Center, Saniuk is in charge of tennis programming, staffing and most of day to day operations at Miracle Hill. Saniuk is also an active member for the Omaha Tennis Association and last year served as the Vice President. Over the last 10 yrs Saniuk was the head coach at the university of Nebraska, Omaha. He spent a majority of his time managing, recruiting, fundraising and coaching his programs. He also taught lessons for the City of Omaha under Rick Faust. James B. Christensen is a novelist and screenwriter. 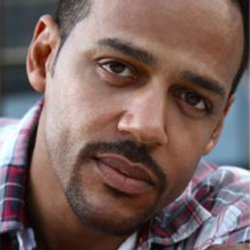 He has optioned two scripts and worked on many work-for-hire projects and collaborated on local short films. He has written feature-length and short film scripts in many genres. In 2008, James attended Lew Hunter’s Screenwriting Colony in Superior, NE. He is also the author of the novels Honeymoon Phase and The Vessel. He lives in Omaha with his wife and twin daughters. 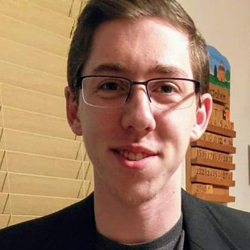 Kyle Kruse is a freshman Journalism major from the University of Nebraska – Lincoln. He started reviewing films three years ago on his blog, www.kruzereviews.com. He’s since been published by the Fremont Tribune and is currently reviewing and writing film content for the Daily Nebraskan. He’s an avid lover of all things movie-related. A few of his favorite films are “The Lord of the Rings”, “Birdman or (The Unexpected Virtue of Ignorance)”, the original “Star Wars”, and “Singin’ in the Rain”.